DENVER (AP) — Onside kicks have always been a bad bet, just not like this. Thanks to the NFL’s rules changes on kickoffs that were designed to reduce the risk of concussions, successful onside kicks have almost disappeared entirely from the game. Kicking teams have recovered three of 34 onside attempts this season, an 8 percent success rate that pales in comparison to last year’s 23 percent conversion rate when 13 of 55 onside kicks were recovered by the kicking team. Over the last decade, that success rate has hovered around 15 percent. That’s because teams can no longer overload to the left or right of the kicker, what special teams coaches used to call a “see-saw” formation. They must have five players on each side now — two inside the hashmarks, two outside and one rover — and they can’t be bunched up or get a running start anymore, either. With six weeks left in the season, the NFL is on pace for the fewest onside recoveries (five) since 2009, when six of 41 onside kicks were recovered by the kicking team. 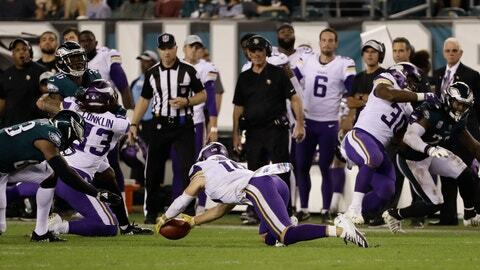 Yet, it’s hard to imagine the league going back and tweaking the new rules to give the kicking team more of a shot. Only the Giants (1 for 4), Lions (1 for 3) and Jaguars (1 for 1) have been successful at onside kicks this season. The NFL has had the most points scored (7,791), most touchdowns (895) and most touchdown passes (570) through 11 weeks in its history. So far, half of the NFL’s 32 teams have topped 40 points, including the Saints six times and the Chiefs four times. Remember that thriller in New England when the Chiefs lost 43-40 back in Week 6? Kansas City is now the first team since the Giants in 1966 to lose twice when scoring 40 points. The Chiefs are averaging 34.8 points in their nine wins and 45.5 points in their two losses. Steelers quarterback Ben Roethlisberger doesn’t know what to make of that Chiefs-Rams slugfest Monday night. But it wasn’t all about the zippy offenses. Like those Big 12 shootouts where points pile up, a key stop can make all the difference. Three defensive touchdowns, eight sacks and seven takeaways all had as much to do with Rams 54, Chiefs 51 as did Jared Goff and Patrick Mahomes. —The 14 touchdowns were more than the Bills (13) have scored all season. —The Rams put up 54 points on 455 yards of offense a day after the Buccaneers managed three points on 510 yards of offense in their 38-35 loss to the Giants. —The Chiefs are the only one of 218 teams who were left lamenting a loss after putting up 50 points. —And the combined 1,001 yards were 150 yards shy of the NFL record. The Patriots and Eagles combined for 1,151 yards in last season’s Super Bowl , a number the Chiefs and Rams might have reached were it not for 21 flags that siphoned away 195 penalty yards. Lamar Jackson became the last of the five QB first-rounders to start when he subbed for an injured Joe Flacco and led the Ravens past the Bengals 24-21. Jackson threw only 19 passes and ran 27 times, more rushing attempts than any QB since 1970 — and more rushes than Kareem Hunt (14) and Todd Gurley (12) combined for Monday night.